Phil Ivey is one of the best professional poker players, debatably of all time. Some online poker review sites call his the “Tiger Woods of Poker”. His has accomplished a plethora of achievements in the work of poker. Mr. Ivey has won eight World Series Of Poker Bracelets; forty-nine WSOP crashes, and has a total of over six million dollars in total including circuit earnings. Mr. Ivey was born in California and currently is said to live in Las Vegas. He is a land based poker player as well as an online poker player. In 2005, Ivey was named Bluff Magazine’s Player of the Year. Phil Ivey likes to play for high stakes, and he likes to play against the best. The online poker review sites state that he once beat Andy Beal who is a Billionaire from Texas. The total sum was allegedly sixteen million and the game went on for three days. 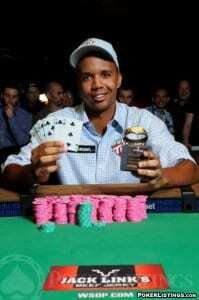 Mr. Ivey has won countless tournaments in the world series of poker. The online poker review sites say that Mr. Ivey won a very long heads-up game against John Monette. After his victory, Mr. Ivey won another bracelet in the $2,500 1/2 7Card Stud Hi/Lo 1/2 Omaha Hi/Lo event besting a field of three hundred seventy six people. American Poker Directory considers Mr. Ivey as one of the best poker players of all time.